Confirmation hearings aren’t supposed to be fun, exactly, but some turn out to be far more brutal than others. A dramatic showdown seems likely for President Donald Trump’s nominee to serve as CIA Director, Gina Haspel, who will face a grilling on Wednesday by skeptical Democrats wary of her record on torture and annoyed by the CIA’s reluctance to declassify central components of that record. 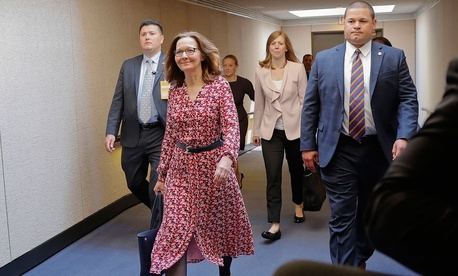 Haspel, a thirty-year agency veteran well-liked and respected by her colleagues at Langley, has been sharply criticized for the role she played in the CIA’s now-banned torture programs and the tape recordings of which she purportedly helped to destroy. Now, Democrats have to make a decision: help to confirm someone with a dark past, or risk her being replaced by a Trump loyalist? Haspel sought to withdraw her nomination last week after some White House officials worried that the Senate would block her confirmation, according to The Washington Post. Trump, along with White House Press Secretary Sarah Sanders and White House Director of Legislative Affairs Marc Short, have pressed Haspel to continue the process. Haspel was making the rounds on Capitol Hill on Monday ahead of her hearing, trying to win over Democrats like West Virginia Senator Joe Manchin and New Mexico Senator Martin Heinrich. Democrats are aware of Haspel’s popularity within the agency, according to one Democratic committee source, and the fact that the alternative could be a political appointee “like Tom Cotton.” (Several CIA veterans reacted with alarmlast year when news broke that Trump was considering replacing Pompeo with Cotton.) The irony here is clear: Haspel, a career official and agency insider unlikely to appease Trump, is facing resistance from Democrats staunchly opposed to the president. Still, the Democratic aide told me, “there is definitely a sense of, ‘if not Haspel, then who?’ It is unlikely we'll get someone better.” Indeed, Haspel will walk into her confirmation hearings with one trait that could win over skeptical Democrats: She is not a Trump loyalist. Senator Dianne Feinstein, a Democrat on the Senate Intelligence Committee, blocked a promotion for Haspel years ago over her role in the interrogation program and the destruction of the tapes. While she wants more information from the CIA about Haspel’s background, however, she “will likely be a ‘yes,’” one of the sources told me. (Feinstein’s press secretary, Ashley Schapitl, said that aide was “certainly not informed” on Feinstein’s thinking.) Manchin and Warner are “gettable,” too, this person said, noting that many of Warner’s constituents are agency employees who like Haspel. Haspel oversaw a CIA black site in Thailand where two terrorism suspects were tortured, and her name was on the cable that ordered the videotapes of their interrogations to be destroyed in 2005. A memo written by the CIA’s acting director at the time, Mike Morell, was declassified by the agency last month in an attempt to clear Haspel of responsibility for destroying the evidence. But some key Senate Democrats say it isn’t enough, and have requested that all records detailing “any involvement” by Haspel “in the CIA’s Rendition, Detention, and Interrogation program” be declassified. Haspel, a career intelligence officer who joined the agency in 1985, served as Pompeo’s deputy for just over a year before Pompeo was nominated by Trump to replace Rex Tillerson as secretary of state. CIA insiders feared Pompeo was imposing his religion on the agency and that he was overly partisan at times. Haspel is an insider who has garnered support from anti-Trump intelligence veterans like former CIA Director John Brennan, former Director of National Intelligence James Clapper, and former CIA chief of staff Jeremy Bash, who believe she will serve as a check on the president. More than 50 former senior intelligence officials signed an open letter last month calling for Haspel to be confirmed. Even so, sources emphasized that Democrats are largely reserving judgment until after Haspel’s hearing. “She needs to bring her A-game,” one aide said. Unlike Pompeo—who, despite never working for the agency, was widely anticipated ahead of his confirmation hearing to secure the vote of most if not all Senate Republicans and some red-state Democrats—Haspel’s torture record has made her a hard pill to swallow on both sides of the aisle. Republican Senator Mike Lee is undecided, according to his office, as is Republican Senator Susan Collins. "If Ms. Haspel seeks to serve at the highest levels of U.S. intelligence, the government can no longer cover up disturbing facts from her past,” Collins said in March. Kentucky Senator Rand Paul has made his distaste for Haspel clear, and Arizona Senator Jeff Flake has remained noncommittal, too. It is not clear whether Senator John McCain, an ardent opponent of torture who is currently undergoing treatment for a rare form of brain cancer, will be able to vote in Haspel’s confirmation. But in an excerpt of his new book The Restless Wave— a copy of which was obtained by The Atlantic—McCain details his disappointment with the CIA’s admission that it destroyed evidence of torture.